Lakewood resident enjoying Fall with her favorite dog. On October 20th, the Spooky Pooch Parade happened in Lakewood. It is an annual event for dog owners to dress up their dogs and walk in a parade. This always takes place on Detroit Avenue and it always seems to be a huge success! Last year, there were over 350 canines and a crowd of more than 2,500 people. I would hope it was around the same this year and continues to stay popular. 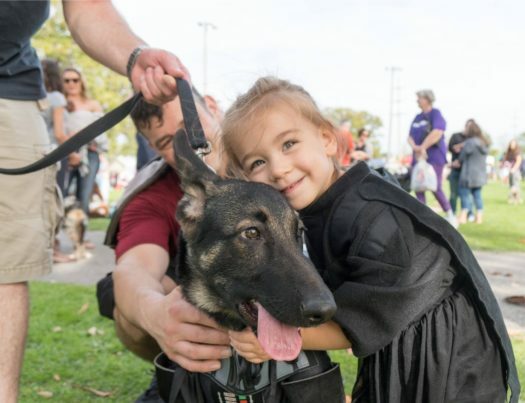 Festivities get underway with the Spooky Pooch Festival that began at 12:30 p.m. at Kauffman Park. Enjoy entertainment, kids’ games and dog-related vendors, including rescue groups and other nonprofits offering canine-oriented goods and services. Kids were encouraged to wear Halloween costumes to carry on that Halloween spirit. The much-anticipated dog parade started at 2 p.m. Dogs of all shapes and sizes dressed in their finest Halloween fashions introduce them and their stuff along Detroit Avenue. Judges award prizes at around 3:15 p.m. in a number of categories, including Best Pooch & Child, Best Pooch & Adult, Best Pooch & Group, Spookiest Pooch and Best in Show. Contestants must participate in the parade in order to be eligible to win a prize and it really catches dog owners attentions with adding on a prize. This is Lakewood’s way of showing care and fun activities for kids and their residents. It is a great memory for the kids to grow up with and there is so many more events to look forward to. Lakewood is full of fun!